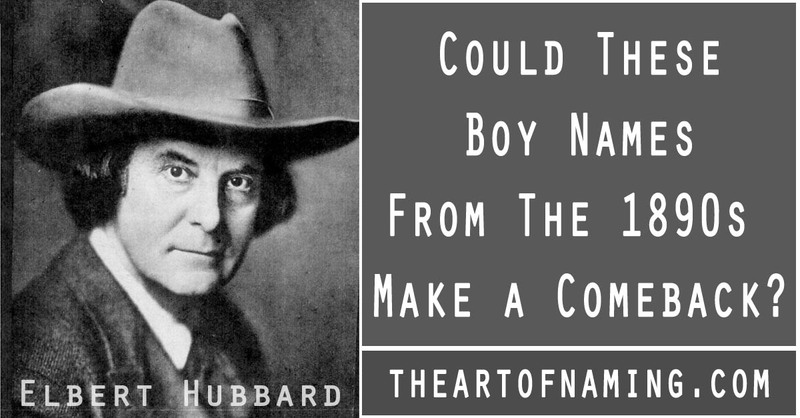 The Art of Naming: Could These Boy Names From The 1890s Ever Come Back Into Style? Could These Boy Names From The 1890s Ever Come Back Into Style? While looking at the Top 200 Names of the 1890s via the Social Security Administration's data, it is obvious that the most popular names of the decade include John, William, James, George, and Charles. Even today, James and William still dominate the charts. In fact, many of today's hottest boy names have actually been popular for decades, starting way back in the 1880s when records were first kept. Today, we're investigating the Top 200 names of the 1890s and you may notice that the same few traditional choices have stuck around from then until now. 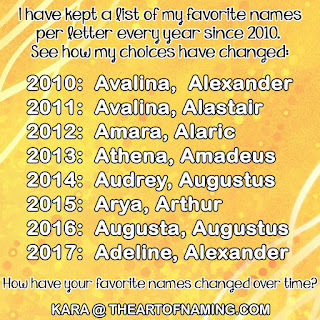 But what about some of the more "old fashioned" names that are no longer in style today? Could they potentially be revived again in the future? I combed through that list from the 1890's collective data for the whole decade and tossed out all of the names that still rank within 2014's Top 1000. Then I picked my 10 favorite names that I think should regain some popularity in the future. 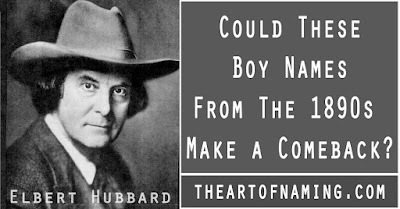 Which of the following ten names do you think really could come back for a modern boy? There's Lloyd, and then there's its variant Floyd. Did you realize these were actually related? Lloyd comes from a surname that was derived from the Welsh llwyd which means "grey". Floyd is an English form of that. Both of these names are on this list today and impressively follow a nearly identical popularity pattern over time. Lloyd peaked in 1918 while Floyd followed in 1926. They both ranked well together from roughly 1912 to the late 1960s. Floyd fell out of the Top 1000 in 1999 and Lloyd followed suit in 2003. Neither name is common now; Floyd had 86 births in 2014 while Lloyd had 119. Which do you like better? Should either be revived for a modern boy? If so, when? This name has a strong, cool meaning. From the Germanic elements bern meaning "bear" and hard meaning "brave or hardy", little Bernards today would be brave little bears. This name was introduced in England by the Normans and was used as a replacement name for the Old English cognate beornheard. There were several saints named Bernard. Barney and Bernie are both potential nicknames, and there are also female forms such as Bernadette and Bernadine. This name peaked in popularity in the 1920s, and actually ranked within the Top 1000 until 2008. As of 2014, there were only 157 boys given the name. Could it go up now with Senator Sanders being in the spotlight? Archie is a diminutive of the German name Archibald which comes from the elements ercan meaning "genuine" and bald meaning "bold". Archibald was introduced by the Normans to England and became common in Scotland during the Middle Ages. In the 1890s, Archibald wasn't within the top 200. Archie was, though. On it's own, it ranked as the 89th most used name of the 1890s. While both names have always been around in the US, Archie was more popular. It peaked in 1918 with 1,111 births for the year. Today Archie and Archibald both rank below the Top 1000, Archie having only 109 births in 2014, and Archibald with 46. If you would like to use Archie as a nickname for a longer name but you dislike Archibald, there is also Archer. Archer has been much more rare over the years but joined the Top 1000 in 2009 and skyrocketed up to #303 by 2014. We've mentioned that the Normans often introduced many names to England. Who were they? Norman comes from an old German name meaning "northman" which referred to Vikings that settled on the coast of France in an area now known as Normandy. Before the Norman conquest, the names Norman and Normant were used in England, sometimes as a nickname referring to Scandinavian settlers. It lost its common-usage in the 14th century but came back in the 19th. As a name, Norman peaked in popularity in 1928 with 5,589 births. It dropped out of the Top 1000 in the US in 2005. As of 2014, there were only 170 births. Along with feminine form Cecilia, Cecil comes from the Roman name Caecilius which is derived from the Latin caecus meaning "blind". So, right off the bat, the meaning isn't that great for these names, but that hasn't stopped parents in the past. Cecil was used during the Middle Ages in England and became common in the 19th century thanks to the prominent noble Cecil family of the 16th century whose surname was actually taken from the Welsh name seisyll. If you want a different meaning than "blind", perhaps go with this one which was derived from Sextilius and Sextus which simply means "sixth". Cecil peaked in the US in 1920. It fell out of the Top 1000 in 1998. As of 2014, only 97 boys were given the name. Glenn comes from a Scottish surname based on the Gaelic gleann meaning "valley". Glenn, and it's shorter form Glen, follow the same popularity pattern with Glenn being more common. They both rose around the late 1910s before peaking through the 1950s and 1960s. Glenn peaked at #55 in 1962. Glen dropped out of the Top 1000 by 2004 and Glenn followed in 2009. As of 2014, there were only 158 boys named Glenn, and 104 named Glen.Which spelling do you prefer? Do you think either could be revived? Just as you might suspect, Willis does come from William. It is an English surname that became a given name for boys. Like William, it is composed of the German elements wil meaning "will, desire" and helm meaning "helmet, protection". Willis was most popular between 1918 and 1930. It fell off the Top 1000 chart in 1994 and remains unranked in 2014 with only 78 male births. There are many other boy names that end with -s that are climbing the charts these days. With William's continued popularity and parents' love of surname names, could Willis come back? Vernon comes from a Norman surname which was derived from a French place name. Both of those came from the Gaulish word vern which means "alder". An Alder is a tree in the birch family. Could Vernon pass for a nature name? Popularity-wise, Vernon peaked in 1920, plateaued through 40s and 50s, then declined after that. It left the Top 1000 in 2003 and was only given to 119 boys in 2014. Would you consider this name? Elbert is the Dutch variant of the German name Adelbert or Adalbert, all of which are related to Albert. The element adal means "noble" and beraht means "bright". A famous Elbert, pictured above, is Elbert Hubbard (1856-1915), an American writer, publisher, artist, and philosopher. There may only be a one letter difference between Albert and Elbert, but Albert has had much more usage. It peaked around 1920 and continues to do well. Nearly a hundred years later, Albert still ranks at #436. Elbert, though, hasn't been as popular. It never really had a high peak and dropped off the Top 1000 chart in 1983. Now it has fallen to a mere 14 male births in 2014. Why does Albert fare so much better? Which do you prefer? Ross is a region in Northern Scotland. Its name comes from the Gaelic word ros which refers to a "promontory" which is a headland, a point of high land that juts out into a large body of water. Ross could qualify as a nature name. This name has had many boosts in popularity. The first was between 1884 and 1890. The second came through the 1920s, then again in the 50s-60s. Its highest peak was in 1985. Ross declined in usage after that, dropping out of the Top 1000 in 2013. Only 184 boys were named Ross in 2014. Which of these names would you have featured on your own Top 10 list? Should any of these be revived in the near future or should these stay uncommon?